Philly to LA on Foot: Lehigh Valley Marathon - Here I Come! Lehigh Valley Marathon - Here I Come! I just signed up for the Lehigh Valley Marathon in Allentown, PA on September 13. 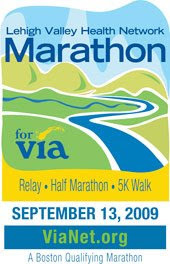 It will be the second marathon after the New Orleans Marathon in February 2008. The Lehigh Valley (which includes Allentown, Bethlehem and Easton) was my home for seven years after college. I very much enjoyed my life there and I miss the area a lot since my move to law school. The area was where my running began nearly three years ago. I trained for my first race, the Broad Street Run, there and started to become the healthy person I am today. Allentown is only an hour away from my family and minutes away from many friends. I missed this so much with the New Orleans Marathon. I only got to see my dad twice and I missed not looking forward to seeing others. This will not be a problem in this marathon. The course was redesigned and made flatter. It runs through beautiful trails (on which I used to run) so that we can stay cool. Last, but not least, THE Bart Yasso is the race director (Allentown is the home of Runner's World.) He's a personal running hero of mine and I want to do something to benefit an organization that he runs because he's done so much to benefit my running life. So there you have it. It's still quite early for training to start, but now I've got the placeholder. Lehigh Valley, here I come! Yahoo! I am so excited to read that you're going for another marathon. Definitely sounds like a god one - too cool that Bart Yasso is the director! A friend was going to train to walk te half... but now she's in a walking boot from a fall on the ice. Bless her heart! I can't wait to hear all about your longruns. I'll be sure to prep the Lehigh Valley for your return. And make sure that you replace lost calories through appropriate means at the Allentown Brew Works. There's a Neuweiler Half and Half in it for you when you finish. Great! Sounds like a nice course. Will be interesting to see how you train for this one. Congratulations on signing up for the next one!!! !